The charming and unfailingly polite Keisha Golding, senior director, global talent acquisitions at Gap Inc, is ruing the five-year gap since her last time home on The Rock. When people ask where her ‘happy place’ is, her automatic answer is always on a beach in Jamaica with a beef patty in one hand and a Red Stripe in the other. 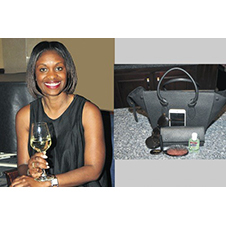 We’re enjoying early-afternoon cocktails at the Jamaica Pegasus Hotel’s Blend Bar + Lounge with the New York resident who’s effortlessly chic in an asymmetric Gap dress, Céline handbag with manila folders containing speaking notes peeping out. She’s due to make a presentation shortly in the ballroom at the Middle Managers’ Conference hosted by Make Your Mark Consultants, but not before we talk moving up the corporate ladder, the Baltimore riots, and what she loves and loathes about Jamaica. We gather you have Jamaican roots. What’s your connection to The Rock? I was born in Annotto Bay, St Mary, and migrated to New York at age six. I distinctly recall starting school in New York in February during the winter months and realising that there was no longer any going to the beach after school as I did in Jamaica. What convinced you to return home to be a presenter at the Middle Managers’ Conference? There’s a similarity in what Jacqueline Coke-Lloyd is doing and what our core values are at Gap Inc in giving people the right skills to advance. There’s a definite synergy and as I have been given the opportunity, during my nine-year tenure at the Gap, to grow from a senior recruiter to my current position as a senior director, I welcomed the invitation to share. Was the choice to work at the Gap strategic on your part? I was attracted to the story of the Gap’s founders Don and Doris Fisher, who established the label in their 40s, borrowing the start-up capital from their children’s bank accounts. Their determination to succeed and looking to build the American dream resonated with me. I also deeply admired the company’s philosophy of social responsibility through their Foundation Arms. It was forward-thinking on the Fishers’ part, and before it became cool for companies to do so. What have been your most cherished moments in the nine years working with the Gap? I build teams and one of my greatest pleasures working with the Gap has been building high-performing teams with amazing people who have had long tenures. The best thing is helping people grow into their full potential. Baltimore dominated headlines after erupting in public riots last week. What’s your take on the state of affairs? I think black lives absolutely matter. I understand the community being shocked and upset [after the death and funeral of Freddie Gray] and what happened was reactionary. I hope the justice system will work and I hope we as a people can take a route to peaceful protest. What do you like the most and least about being Jamaican? I love the spiritedness that Jamaicans have. It’s a natural vibe that I think you could liken to Los Angeles being the chill spot in America. I hate that Jamaica isn’t leading in the way it should. With the spirit and intelligence of the people, coupled with their passion and loyalty, we should be leading in the world. Noel at Noel New York Salon in Bedford Stuyvesant in Brooklyn. Jinsoon Salon on East 4th Street. What music are you currently jamming to? I do playlists on Spotify. I’m listening to the Best of Sade, Drake’s new album, and Beres Hammond. Which designers would we find in your wardrobe? I look at everything. Design is my niche. I shop the Gap and Old Navy. I love Céline. I like Marni. I also shop smaller brands at Fred Segal. Doing something that I have never done before with the person I am intrigued by. Someone who is ambitious, compassionate, thoughtful, laughs a lot, and loves his family. Happy. I cannot paint a scene of exactly where I’ll be then, but I know I will be happy.